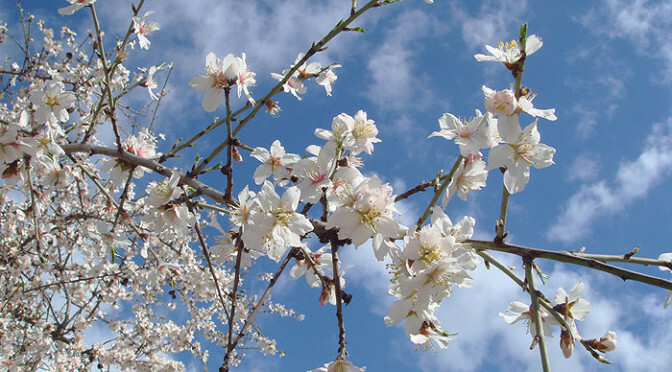 The scientific name is Prunus dulcis, and it is part of the peach family. 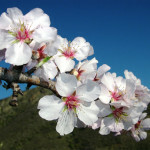 Whereas the edible part of the latter is the thick fleshy outer layer, the almond fruit is more nut-like, and it is the kernel residing in the centre that we eat. You will be familiar with the characteristic hard shell of an almond, on the tree this is surrounded by a green hairy coat which turns grey and shrinks in the heat of the summer. 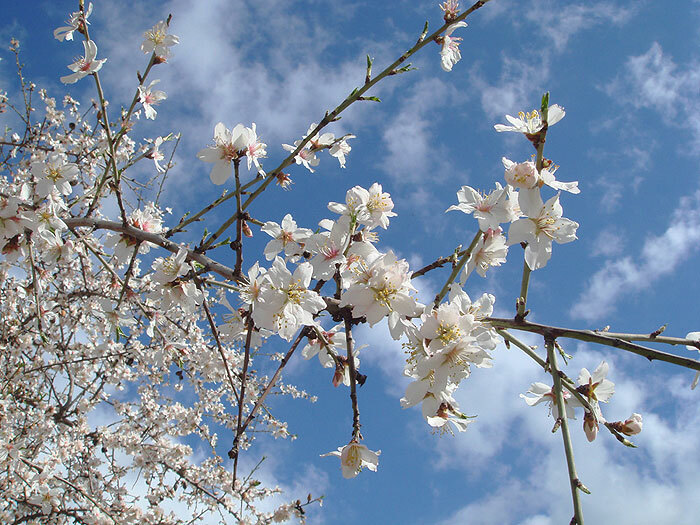 After flowering in the early spring, the fruits mature through the hot summer and are harvested during the autumn. There are two varieties of almonds: sweet and bitter. Bitter almonds are toxic if consumed in quantity. 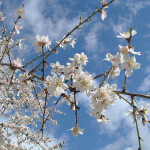 But, once the naturally occurring prussic acid has been removed the oil of bitter almonds can be used in the manufacture of flavouring extracts for foods and liqueurs. 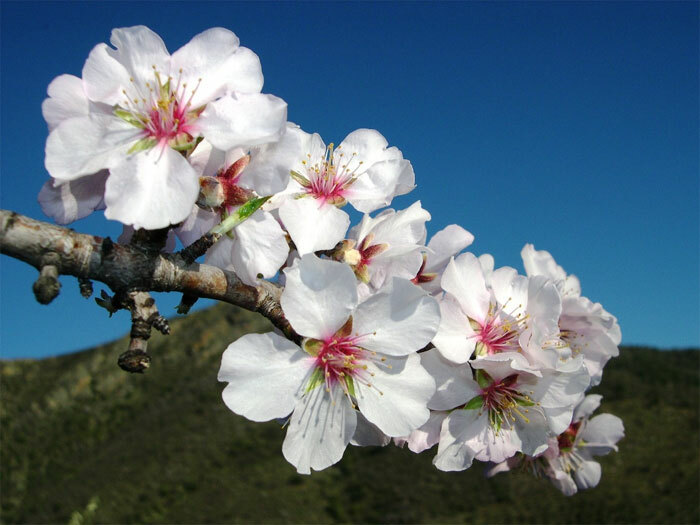 The origins of the almond tree have been traced back to south western Asia, and biblical references suggest that almond nuts have been grown in Israel since 2000 B.C. Now primarily grown in Mediterranean climates, they are an economically important crop. Centuries of selection and cultivation have ensured sweet flavour, large seeds and high yields, with the Marcona and Valencia cultivars originating from Spain. 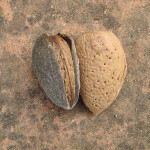 Sweet almonds can be bought in their shells, pre-shelled, blanched (treated in hot water to remove the brown seed-coat), flaked, kibbled or ground into flour. Recipes including almonds range from savoury to sweet, breads and pastries, marzipans to liqueurs. They can be eaten raw, toasted or baked, this versatility and rich flavour makes them very popular. Almonds are even in many skin products in the form of Sweet almond oil, which also makes the perfect base oil for body massage. 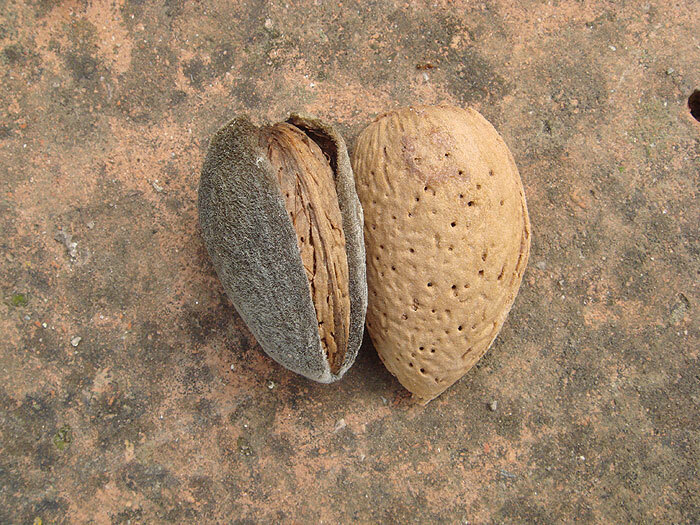 Marcona almonds (a cultivar originating in Spain) are more rounded in shape and favoured for making bars of Turrón, a popular Christmas treat. Turrón can be soft or brittle and ingredients vary greatly, based on whole or crushed and ground almonds, then adding sugar, honey, egg, cinnamon, lemon, chocolate, coconut, walnut and a whole host of other ingredients.